What is it about rivolis that makes a beader’s heart stop? 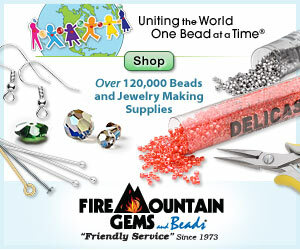 These beautiful, holeless beads are so captivating and irresistible. Perhaps it is their jewel-like quality. When many rivolis are seen together, they look like a handful of cut gems from the set of a pirate movie. It could also be the challenge that they pose - they dare us to find new ways of using a bead that is not really a bead by definition. Whatever the attraction is, there’s no denying that pointed-back rhinestones are wonderful little treasures. Whenever one or more is added to a piece of beadwork, the wow-factor increases by leaps and bounds. They have a sparkle all their own. They come in gorgeous colors. They are just plain beautiful. It’s no wonder that they, and other solid crystal shapes, are always a favorite material for renowned beaders like Laura McCabe. The most common technique for making a rivoli useful is the peyote bezel. Worked in two seed bead sizes, these little jackets are simple to do, and easy to embellish. Once the bezel has been secured, that’s when the real fun begins. The curve of the peyote shell makes the perfect base for all kinds of fringe. You can add extra layers of peyote stitch, and even go freeform! For a fun project, try using your favorite rivoli with Royal Ring by Elizabeth Pullan and Bead & Button. 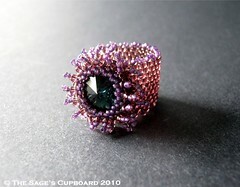 You can also try creating bezels with netting and right angle weave! For today’s ring, I started with a rivoli in my absolute favorite crystal color - Montana sapphire. I love the deep, almost melancholy shade of blue. After adding a bezel in plum, I added two rows of plain fringe between the stitches, and secured it to a plain peyote band. I kept the overall design as simple as possible, so as not to overpower the color of the rivoli. I like the purple and blue combination. It has a sort of sadness to it, that might very shortly spill over into anger. It’s like a broken heart. 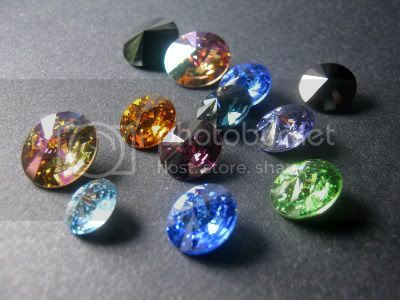 I love the rivoli crystals -- they are even more gorgeous in real. I recently purchased a variety of colors to add to my clay jewelry which should be a lot of fun. Can't wait to get started. I totally get the heartache in this piece...It's a ring of forgotten love. You rarely see a piece of jewelry that conveys a message that isn't a "happy" one. You did it very, very well. Rivolis in clay! That sounds exciting, you could do some pretty magical things with that combination. Marsspyder: I'm so glad that the melancholy is showing through! Thank you so much! Wow, my new favourite ring...It's a real beauty!